Service Costs > How Much Does MinuteKEY Cost? How Much Does MinuteKEY Cost? Founded in 2008, MinuteKEY, an automated key copying machine, allows you to copy a home, office or padlock key in less than a minute. Today, you can find the kiosks in popular retailers such as Lowe’s, Menards and Walmart. While the official website does not disclose the prices, the estimates we researched were primarily based upon the type of key you want to be copied and the design of the key since the kiosk offers a variety of designs, such NFL and NBA keys, to name a few. To budget, the average key will cost about $1.49 to $3.99 each to duplicate, but the more keys you purchase at once, the more you can potentially save. UberGizmo.com, for instance, states a trio of keys can cost $3. The company also offers a VIP program, which can decrease the cost estimates mentioned prior. If you become a member, you will earn discounts and rewards based on the number of keys you copy. What kind of keys can the kiosk copy? According to the company’s official FAQ, the machine can copy most office and home keys, including Kwikset, KW1, KW10, Schlage, SC1, Weiser, WR3, WR5, Baldwin, Titan, some padlock keys and clones of the above-mentioned brands. The kiosk, at the time of this publishing, is unable to copy car keys but can identify them if needed. 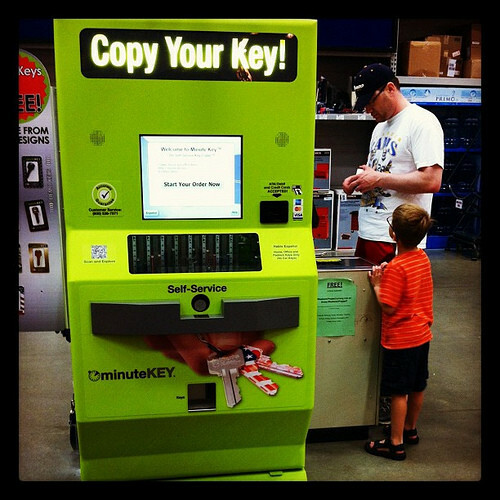 If you’re unsure if the kiosk can copy the key, the company states the machine will be able to automatically identify your key and determine, at the time, if it can duplicate it. If the machine is able to duplicate it, then you will follow the prompts on the screen to place your order, select your key design and allow the machine to do the rest. The company states the machine is more accurate than a retailer as it uses computer technology to create an almost-perfect cut. By chance, if the key isn’t cut to perfection, then the company does offer a 100% customer satisfaction, in which they will fully refund you within 30 days of purchase. The machines accept MasterCard, Visa and American Express credit cards and do not accept checks and/or cash payments. The kiosk, unlike some competitors, will not store your key profile upon completion. To find a kiosk near you, refer to the company’s official kiosk search feature. To see the key designs available at your local kiosk, you can do so here. MinuteKEY coupons are commonly available, so it doesn’t hurt to look for one before you go to a kiosk to see if you can save. For example, if you sign up for the VIP club, the company offers $1 off coupons.